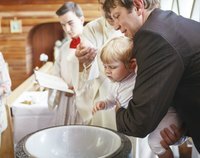 A child's christening serves as a public introduction to the world, a religious initiation and a time of bonding between the child and parents. Many christenings are followed by receptions in which guests gather to celebrate and play games. If you have a lot of children at your christening reception, set up a children’s corners. Small children can go here and play games of their own, without the adults having to worry about them. As the host, ask your guests to bring pictures of themselves as babies. Arrange the photos on a cork board and, during the reception, have your guests try to guess to whom the pictures belong. Prizes, such as inexpensive rosary beads or a motivational Christian tchotchke, are then awarded to the person with the greatest number of correct guesses. As guests start to arrive, provide them each with a pin and warn them not to say a prolific word for the event, such as "baby" or "church." Guests who say the word lose their pins to the person who catches them. The person with the highest number of pins at the end of the reception wins a prize. Depending on the location and weather, the christening and subsequent reception can be an opportunity for kids to play outdoor games presided over by two or three adult volunteers. These include all the classic ball games such as soccer; kickball; croquet; bocce ball, a combination of soccer and hockey played with balls and mallets; brandy, in which one player tries to peg others with a soft tennis ball thrown under the arm; and Newcomb, a variant of volleyball in which players compete not to hit a ball but to catch it. Given a large enough area, children can also enjoy scavenger hunts and games of hide-and-seek. Prepare a word scramble game before the party by writing down words related to faith and baptism, and then cut some of these words into pieces and scramble the letters so that guests have to guess what the words are. Play “Baptism Bingo” by making or printing out your own bingo cards and filling up the tiles with the left-over words, awarding prizes to those who fill their cards first. Make an effort to help children understand the significance of the christening by splitting their group into two teams and asking them questions about what baptism is and what it means. Play religion-themed games such as the Bible edition of Apples to Apples to teach them about faith while being entertained. Set up a craft booth where they can make doves out of soap, or hire professional entertainers to play music and perform tricks.